The knee joint connects the upper leg to the lower leg and is used during many physical activities throughout the day. Overuse, however, makes the knee joint prone to inflammation, which can cause pain in a patient. 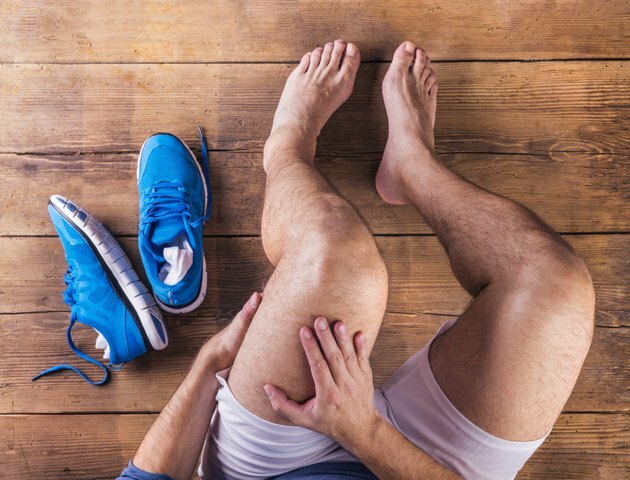 Medline Plus, of the National Institutes of Health, states that common conditions that cause knee inflammation include arthritis, bursitis, knee injuries, tendinitis or a cartilage tear. Reducing inflammation can reduce pain and restore mobility to the affected knee. An inflamed knee should be elevated, according to MayoClinic.com. Elevation is effective in reducing joint inflammation because gravity drains fluids that may accumulate in the knee after injury or flare-up of a knee condition. Further, MayoClinic.com recommends that a patient experiencing knee swelling elevate his knee on a pillow or lie back in a recliner. The patient should elevate his knee when sleeping, and as often as possible during the day. MayoClinic.com states that ice therapy can also be effective in reducing inflammation in the knee. Ice constricts blood vessels in the affected knee and prevents them from leaking fluid into the injured joint. Doctors recommend applying an ice pack or a pack of frozen vegetables to the knee for 20 minutes, three or more times per day. Furthermore, ice should not be left on the affected knee for more than 20 minutes because ice can cause damage to the nerves and skin that surround the knee. Medications may be used to reduce knee inflammation. Specifically, MayoClinic.com states that nonsteroidal anti-inflammatory drugs (NSAIDs) can be used to reduce pain and inflammation in the knee. NSAIDs are effective because they reduce chemical signals in the knee that cause pain and inflammation. Although NSAIDs, such as Aleve, Advil and Motrin are available over-the-counter (OTC), they should be used under a doctor's supervision if they must be taken for more than a few days. Patient with a history of heart, liver, stomach or kidney problems should not take NSAIDs. Furthermore, a patient taking NSAIDs should stop using them and seek medical treatment if he has bloody vomit, clay-colored stools, heart problems or dark urine. In more severe cases, a doctor may recommend that a corticosteroid drug be injected into the swollen knee. Corticosteroids are strong anti-inflammatory medications that can be injected into the knee capsule to reduce inflammation. Only three injections can be given per year to prevent unwanted side effects. The rare risks of this procedure include infection, excessive bleeding and possible tissue damage.